This is a post in the series commemorating pioneering evaluation studies in conjunction with Memorial Day in the USA (May 28). 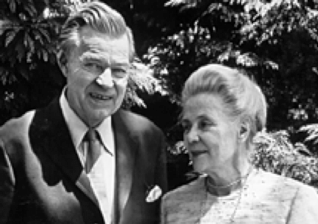 I’m probably not alone in admitting that I had no idea who Alva and Gunnar Myrdal were, even as I was receiving an award named after them. So here’s the scoop on what I’ve learned: Alva and Gunnar were Swedish scholars, coming into their prime in the 1930s and 40s. In Sweden back then, like in America, white women were viewed as inferior to white men, while in America in particular, Black people of all genders were seen as second class citizens. So, the Carnegie Corporation of New York funded a six-year study on US race relations and chose Gunnar, a Swedish economist and Nobel laureate, to conduct it because as a non-American he was thought to be less biased and more credible than American researchers. (Alva’s considerable contributions to the writing and editing are overlooked because she was not acknowledged as an author.) 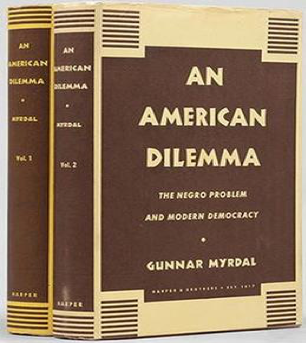 ANYWAY, Gunnar’s study of race relations, An American Dilemma, was published in 1944. The distinguished African-American Ralph Bunche served as his major American researcher. The 1,500-page study detailed what the Myrdals identified as a vicious cycle in which white people justified their white supremacist behaviors by oppressing black people, and then pointed to black people’s poor performance as reason for the oppression. The Myrdals were ultimately hopeful that improving the circumstances of black people in America would disprove white supremacy and undermine racism. The Myrdals’ book was cited in the U.S. Supreme Court decision Brown v. Board of Education that desegregated schools. It is especially timely to remember this pioneering policy evaluation work and breakthrough Supreme Court decision because Linda Brown, the student in the Brown decision, died earlier this year at age 76. Former AEA president/queen Eleanor Chelimsky recalls that, when establishing the Myrdal award, association members “had universal admiration for The American Dilemma. It was an important and courageous effort to draw attention to the continuing problem of race in America.” This pioneering book sold over 100,000 copies and is often cited as an exemplar of social science research and evaluation influencing both policy and public opinion. The fact that I have a PhD in evaluation and didn’t know anything about this pioneering work is a sad sign that this early study and others published this week are alive in the minds of our evaluation elders but considered history to my generation of evaluators, a history that could be forgotten. The American Evaluation Association is celebrating Memorial Week in Evaluation. The contributions this week are remembrances of pioneering and classic evaluation publications. Do you have questions, concerns, kudos, or content to extend this aea365 contribution? Please add them in the comments section for this post on the aea365 webpage so that we may enrich our community of practice. Would you like to submit an aea365 Tip? Please send a note of interest to aea365@eval.org . aea365 is sponsored by the American Evaluation Association and provides a Tip-a-Day by and for evaluators. Yes, thanks as always, Stephanie. I agree that it’s a shame that most of us with advanced degrees in Evaluation cannot discuss the Myrdals’ work (or anyone else’s) regarding race (among other dimensions along which oppression operates), despite having one of AEA’s awards named after one of them. I was fortunate to be able to fill that gap through my dissertation research, but the fact that it is not a core element of our education, or named in the competencies, or considered relevant by many evaluation professionals means the overwhelming majority of evaluators are ill-equipped to judge the merit or worth of (or build evaluation capacity among) social, educational, and public health programs, as they have no understanding of racialized patterns of poverty, disease, and violence in the USA (and elsewhere). I hope your post will inspire at least some to acknowledge and fill the gaps in their own educations. Thank you for this important and historical reference by Myrdal, Stehphanie – and Congratulations!